State transportation officials will start public hearings this week on a high-speed rail study that includes Oklahoma and Mexico, and officials are also expected to launch a commission to look at a rail proposal focused on Dallas-Fort Worth. The Texas Transportation Commission is expected to vote Thursday at its monthly meeting on the creation of a high-speed rail commission focused on the Dallas-Fort Worth area. 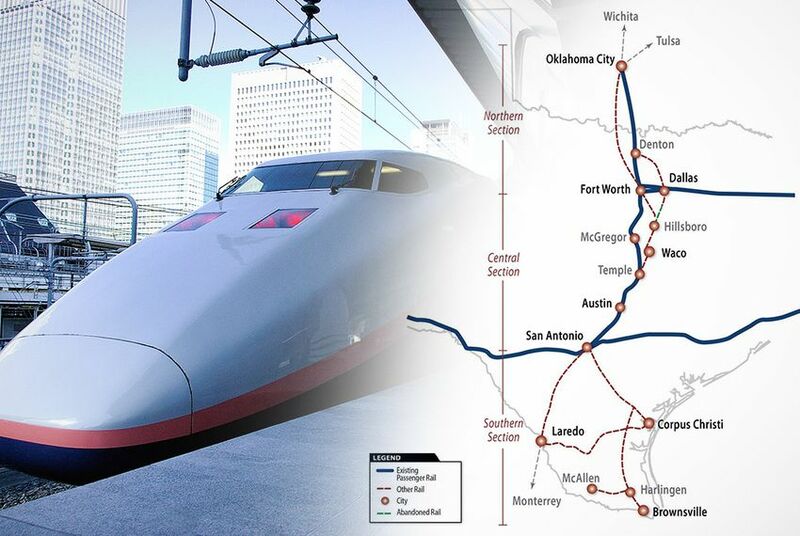 Separately, TxDOT is holding a series of public meetings around Texas and Oklahoma, starting this week, to hear comments on a study looking at the feasibility of high-speed rail projects between Oklahoma City and South Texas. Texas Transportation Commissioner Victor Vandergriff stressed that the two initiatives should not be interpreted as a decision by TxDOT to develop any high-speed rail projects in Texas. The new high-speed rail commission will advise state transportation officials on “the development of intercity rail corridors, new transportation policies, and funding and procurement strategies as they relate to the implementation of proposed high-speed rail connecting the Dallas and Fort Worth areas,” according to TxDOT’s agenda for the meeting. Officials in the Dallas-Fort Worth area have seen renewed interest in developing a commuter rail line linking the two cities, plus a third stop in Arlington, with a private high-speed rail line in development from Dallas to Houston. Texas Central High-Speed Railway, the Japanese-backed firm that plans to construct the project without public funding, is expected to file federal documents in April that will include more details of the project, including the preferred route. The Federal Railroad Administration is participating in separate environmental impact studies on a Dallas-to-Houston high-speed rail project and a Fort Worth-Dallas project. Vandergriff confirmed a report in the Fort Worth Star-Telegram that Bill Meadows, a former state transportation commissioner and former Fort Worth City Council member, is likely to be tapped to lead the commission. TxDOT launched its Texas-Oklahoma Passenger Rail Study last year to take a wide-angle look at the impact of potential rail service projects between Oklahoma City and the Texas-Mexico border. This month, TxDOT officials announced plans to expand the scope of the study south, to Monterrey, Mexico, to account for interest in building a high-speed rail line between Monterrey and San Antonio. At Friday’s rail conference in Dallas, TxDOT Rail Director Erik Steavens predicted the study would guide future efforts to develop various passenger rail services with the potential to serve millions of passengers along a route that stretches more than 800 miles. Starting this week, TxDOT is hosting public meetings in six Texas cities to hear thoughts about the study. The Oklahoma Department of Transportation will also host meetings on the study in Ardmore and Oklahoma City next week. “We’re working very hard to get these studies together so, in the event of public funds available, we’re ready,” Craig Moody, the rail programs division manager with the Oklahoma Department of Transportation, said at Friday’s rail conference.